This album recorded with Gordon Giltrap has been completely re mastered and re packaged and is re issued with 2 bonus tracks. The stylish production includes several new pictures of Raymond and Gordon and informative booklet notes provided by Paul Fowles. Originally released in 2004 the tracks on this album read almost like a Giltrap retrospective with every decade of his 35 years represented. Steel and nylon = beautiful music. 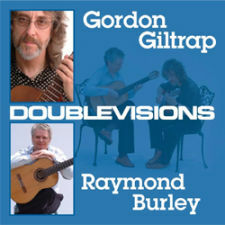 The worlds of classical and folk meet on this collaboration between Gordon Giltrap and Raymond Burley, two renowned talents within their fields, bringing together Giltrap's steel strung genius with Burley's virtuoso nylon strung finger-picking. It should be noted that this was originally released in 2004 and is only now being reissued (remastered and repackaged with two bonus tracks). The album features a reworking of Giltrap's 'Heartsong', a 1978 hit single, alongside a number of other Giltrap favourites (14 of the 16 are Giltrap tracks) all made more beautiful by the addition of Burley's playing. The album works pretty much as you might expect, both guitars taking turns at centre stage and complimenting each other wonderfully. Recorded in the splendid acoustic of Holy Trinity Church, Weston, Herts, this recording - engineered and produced by John Taylor - brilliantly captures the contrasting but related textures of nylon and steel-strung guitars. Here are two players, at the top of their game, in excellent duo arrangements by Ray Burley of some of Gordon Giltrap's more well-known compositions. The interplay between these fine guitarists sparkle with vitality and energy, and they achieve a difficult goal - the combination of two different styles, backgrounds and instruments into a successful whole.